February 27th, 2006 @ 12:41 AM Atbp. If you’ve ever bought or at least checked out craft magazines–be it about beadwork, quilting, jewelry-making, bag-making and the like–you’ll know how insanely expensive they are. There are some that cost just around 200 pesos, but considering the fact that they usually have less than 10 pages, you’re better off buying the pricey ones. Don’t get me started on craft books. While browsing through the shelves of National Bookstore on Scout Borromeo, I discovered an untapped alternative. On the same row of shelves as the fashion books, I saw locally-made manuals on patternmaking, tailoring and sewing. 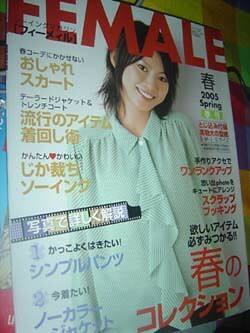 Below those, I saw Japanese and Chinese magazines that had a lot of patterns inside. I remember having much thicker, old-fashioned versions of those lying around the house when I was a kid because my grandmother knew how to sew. But what’s cool about the magazines I saw at NBS is the contents aren’t all dress, skirt and blouse patterns. They also teach you how to make accessories like bags, brooches and hats. And all for 85 pesos! Of course, the catch is you have to make sure you will understand the instructions. While the illustrations are detailed enough to follow, it can still be quite challenging. For example, I had to give up the issue that had a lot of fancy bags made mostly of beads because I found it too complicated. But if you’ve got enough experience doing crafts, it’s a good and cheap alternative.